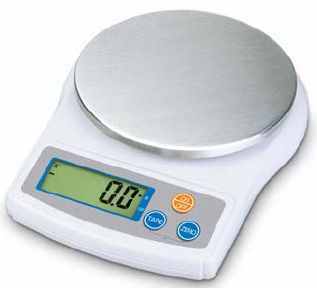 All-purpose scale for office and/or laboratory. Featured by a reduced size and large load capacity, it offers high weighing accuracy thanks to the 10.000 reading divisions. LCD display with 5 digits 15 mm high. Waterproof simplified mechanical keypad with 3 keys. Stainless steel plate, Ø 120mm size. Power supply: 2 fitted extractable batteries of the 1,5V AA type. Packaging: 220x170x52mm size - approximate weight of 440g.